A film that should have taken more pride in it’s story and cast. Solidly acted, well written but a case of hype helping an easygoing biopic that seemed to hinder as it reached it’s conclusion. To be honest, I think it may be a sign of the time. Despite it’s subject matter appearing “controversial”, it seems to be showing that we are very much past that era. The fact that nowadays a film like this can be viewed and received positively says it all. I know I wasn’t around during that period and I can certainly empathize. But I’ll never really know what these groups truly went through. Director Matthew Warchus and writer Stephen Beresford capture that perfectly and there are endearing moments as the Lesbians and Gays Support the Miners group suffer the scrutiny of the miners as they try and show their genuine support. An attempt to publicise their beliefs soon becomes so much more once they meet the mining community and realise that despite conflicting sexualities, the groups very much share something in common and unite in a time of desperation, anger and torment. My main issue is that the film deals with it far too lightly and for it’s all hype, I wasn’t really laughing that much nor did I shed a tear. At times, the story felt like it was going through the motions. It’s tough to stick to a true story without exaggerating certain facts to make a little more drama. However, I feel maybe a little more could have been exaggerated to justify the 120 minute length. When I saw the trailer, I expected an OTT, feel-good laugh a minute British dramedy. It certainly ends uplifting and brings the odd chuckle but most of them are revealed in the heavily flogged trailers. If you’re lucky then the jokes will certainly be fresh to you. One thing I will definitely commend is the cast of British talent at Warchus and Beresford’s disposal. It was a surprise to see ol’ McNulty from The Wire in drag. Dominic West plays the role perfectly, balancing it with the right level of camp and heart. Bill Nighy and Imelda Staunton are, to be expected, superb taking roles with completely different temperaments. Nighy’s deadpan but gentle Cliff to Staunton’s domineering outspoken chairman Hefina. Paddy Considine played Dai brilliantly. A complete change from his more introverted and volatile roles (Dead Man Shoes being a personal favourite). The film also gave opportunities for up and coming actors. Ben Schnetzer was fantastic as group leader Mark. He is one to watch and has made a huge transformation from his supporting role in the highly enjoyable The Book Thief. He certainly carries the group in their time of peril and indeed the film. Jessica Gunning’s performance as the ambitious Sian was also worth noting. She has been around on the UK TV circuit for a while now and was most memorable for her small role in Great Night Out. She certainly proved that she can take a bigger role and deliver just as much gusto. Menna Trussler was superb and in scene stealing form as the gullible and naïve Gwen. A loveable sweetheart whose intentions are in the right place, even if they may have come out the wrong way. “Where are my gays? I’ve missed them”, as well as her bizarre questions that she wanted rectifying after hearing from a friend down the market. She certainly delivered the one liners. Andrew Scott (Moriarty from Sherlock) was finally able to make an impression once his character was allowed to open up. A meeting with his mothers after years of being shunned seemed like a missed opportunity that was dealt with far too easily and quickly for my liking. Faye Marsay (Fresh Meat) was very good as Steph, the only lesbian in the group. Joseph Gilgun played the role incredibly straight faced, which made a change after his role as Rudy in Misfits. However, you really wanted him to have some of that eccentricity as his character is hardly memorable. Liz White (or Annie from Life on Mars) played the role of Dai’s supporting wife as well as she could but is somehow pushed into the background. With respect to the miners, Warchus and Beresford do not portray them as oafish or as naïve as you first anticipated from the trailers. Beresford has established an array of well rounded characters that stand out and are easily relatable to. 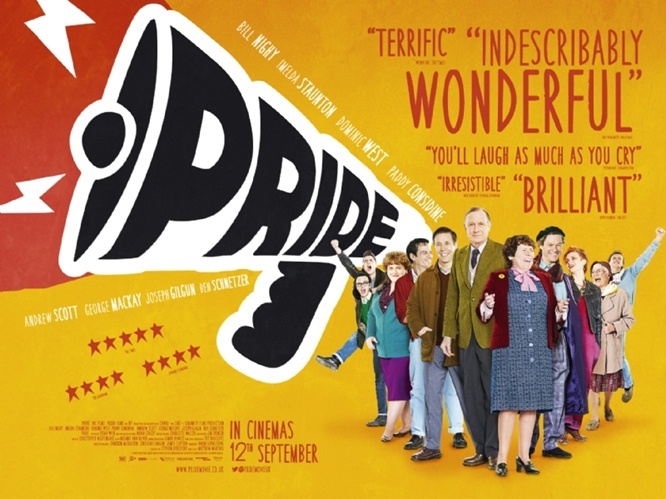 At Pride’s heart it is still a story of two groups of people that were being shunned and downtrodden by the public, the papers and the government (most importantly). The AIDS propaganda campaign. The red band coverage of the miners’ strike. It was a surprise to believe that the majority of the events did happen and as the credits appeared over each character explaining what happened after this unifying moment, there were some surprisingly revelations which did hit home. The soundtrack was brilliant and really ignited that nostalgia for the 80s. Well acted, well written, bit long at the tooth but . . .
For all the hype, the best British film of the year? En par with The Full Monty, Brassed Off and Billy Elliott? A film that will stand time and be remembered in the future. Not to me, I’m afraid pet. 3.5/5 Still one of the better ones but for it’s all hype, falls short for me and could have been more. Worth a gander most definitely.